Silje Garmo, a Norwegian woman, and her young daughter, Eira, have been granted asylum in Poland, because she feared that social services in her home country would try to separate them, her lawyer said. “With this move, Poland has confirmed that protecting the family requires a decisive international response,” Ms Garmo’s lawyer, Bartosz Lewandowski, was quoted as saying by the Polish public broadcaster tvp.info. Ms Garmo wrote to Poland In to express her gratitude following the plight she had to face. Ms Garmo, 37, arrived in Poland with Eira, in May 2017 after being warned by friends that her child would probably be taken away, according to tvp.info. Eira was four months old at the time. Norway’s Barnevernet child welfare service accused Ms Garmo of overusing painkillers and of suffering from chronic fatigue, the Polish public broadcaster stated. 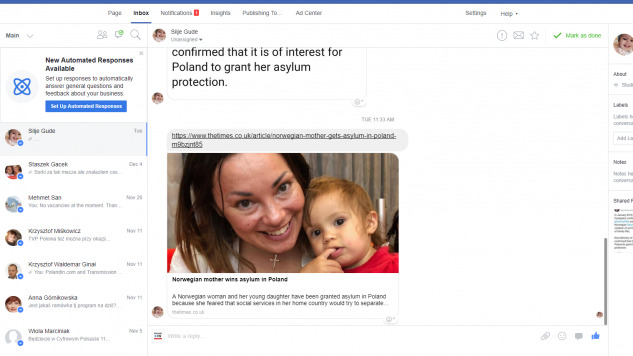 Eira is now almost two years old and has been living in Poland for most of her life, tvp.info reported. Barnevernet, the Norwegian child welfare service has come under international and national scrutiny for being excessively interventionist in the past. Its child protection practices have been accused of lacking human elements and officials are said to resort to the extreme measure of separating children from their parents.